This smoothie is for all the coffee, latte, and mocha lovers out there. For some people, the day doesn’t officially start until they have their morning coffee. What if you could combine your morning coffee with several healthy ingredients resulting in a delicious and highly nutritious superfood smoothie? Sounds pretty good, doesn’t it? You can use pretty much any liquid as the base of your smoothie, coffee being a viable option. Coffee along with the other ingredients this recipe calls for combine to deliver a good deal of nutrition. Just what your body needs to ensure you have the best day ever! There’s seems to be an ongoing debate over whether or not coffee is actually healthy or not. My research has led me to believe a cup or two a day is perfectly fine – assuming that you’re not adding in loads of sugar. An organic coffee is also going to be healthier. This recipe calls for chilled coffee, but you could use a warm, but not boiling hot cup and see how you like it. Warm smoothies can be very comforting on a cold winter day. Another option is to forgo the fruit (banana and cherries) and use a tablespoon or two of coconut oil for a rich, creamy, elixir. Finally, you can freeze your coffee and use the ice cubes in your smoothies. Experiment and see what you like best. If you’re not a coffee drinker, simply substitute your favorite black tea or just use more milk. Enjoy! I’d love to hear what you think of this cherry chocolate mocha smoothie in the comments below. Happy Blending! That sounds pretty good. I don’t think I’d add the maple syrup for flavor – it might make it too mapley? I do like the idea of adding the protein powder to get more protein into the drink and definitely vanilla extract – I put that in almost all my smoothies! 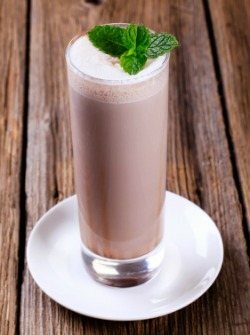 Vanilla and chocolate protein powder go well in this smoothie, as does vanilla extract. I use vanilla pretty liberally in my smoothies too. Stevia and honey are probably better sweetener options for this smoothie. Thanks for the recipe. I made it, and added chia seeds and a small amount of rolled oats to give it more texture and fiber. I made the coffee twice as strong and added a tiny bit more cacao powder; it was quite good but not frozen enough for me, despite me using only frozen fruits. I used regular, lactose free milk; I did add honey as it wasn’t quite sweet enough. In the future, I’ll try either freezing the coffee, or using a little yogurt and a reduced amount of milk for a thicker texture. This will stay in my rotation! I love to hear how you’ve taken the original recipe, tweaked it, and pretty much have your own version that’s perfect for you. This is exactly what I want to convey to everyone out there making smoothies. We’re all unique and therefore enjoy unique smoothie creations. Chia seeds, rolled oats, more cacao and honey sounds good to me! Have you tried dried cherries, berries, bananas? They pack a powerful concise ripe fruit flavor.